In any case, single-page sites are cropping up all over the place. But figure out when to use a one-page design and the best way to go about creating one is still a challenge for many. While a lot of general web design best practices apply to single-page sites just as they apply to more complex sites, there are some special considerations, which we’ve included below. Is a One-Page Site Right for Your Project? Single page websites seem to be particularly popular among designers. But that doesn’t mean those are the only sites they’re appropriate for. Other places we’ve seen them include app websites and websites for particular products (like books). So how do you decide if a one-page site will meet your needs? A single page website can be a great solution for selling one product, like a book, website theme, or similar. A very large number of single-page sites use Ajax and JS for navigation and other elements. It’s a very valuable way of creating an uncluttered site that still contains a fair amount of content. Is my content all related? Trying to put a bunch of unrelated content on a single page is likely just going to confuse your visitor. If you have a bunch of unrelated pages, they’re probably best left as separate pages. When designing a single-page website, limiting the amount of content is important. First of all, rememeber that all your content needs to load at one time (unless you’re using Ajax, but even then there’s sometimes a fair amount of content to load at once). Also, if you want to use transitions between your content areas, they often work better when there isn’t a huge amount of content to cover between sections that aren’t bordering each other. Five or six separate content areas seem to be about the norm on many single-page sites. Some sites limit it to only two or three, even. It’s rare to see a site with more than ten different content areas on a single page. A single-page portfolio site that showcases a dozen movie websites. Minimal information is provided in the header, including a contact link. Colourpixel has a lot of varying information on their site, but for the most part everything is kept short and to the point. There’s contact information, a portfolio and about information, all on a single page. Ben Lind’s website includes only the minimum amount of content to get his message across. Single-page sites are perfect for things like events (a wedding in this case). There’s not too much content to include and the single page makes it easy to find whatever you’re looking for. Stoodeo’s site only contain’s a single page worth of content. By placing the contact form to the side, they’ve really minimized the length of the page. Not all horizontally-scrolling websites are single page sites. But a fair number of them are, and it’s an interesting way to break out of the standard single-page box. This site incorporates both horizontal and vertical scrolling to get six pages worth of information on a single page. Charlie Gentle’s website uses a horizontal-scrolling slideshow effect to display content. A huge horizontally-scrolling single page site. They include the contact form right at the beginning, setting it apart from a lot of other horizontal sites that include it on the last screen. Peter Pearson’s site uses a mix of animation and horizontal scrolling on his site. Multiple pages worth of content are broken up across multiple horizontal screens. With a single-page site, you may want to consider the visible area your visitors likely see within their browser. Crafting your pages to fit comfortably within that space can minimize scrolling while viewing individual sections. This can be particularly important if the transitions between areas are important to you. Once a visitor starts scrolling, they may just keep scrolling rather than using your navigation links. This is a very simple, three-screen single page site. Each section of the site easily fits within a single screen and requires no scrolling. The use of bi-directional scrolling to navigate is also a unique touch. The CreativePeople website uses accordian sliders that come up from the bottom of the screen to display content. No scrolling is required. Each content area on the Dafvy.co.uk site fits easily within a single screen with no scrolling required. The background color transitions that occur when you click to navigate to each individual section is a very nice touch. Fuel Brand uses a single-page that fits within your browser window and uses Ajax to show more content. A simple site with a slideshow and minimal information. The content adjusts to your screen size. Most visitors to your site are going to be used to loading a new page for new content. If you squish all the content on your single-page site too close together, they may not see the transitions from one section the next. There are a variety of ways to differentiate between sections. Using a header for each content area is one way. Some sites use an actual line to separate different areas. And still other sites use ample amounts of white space to set areas apart from one another. KINO uses consistent hand-drawn headers for each section of the site, along with a thin, hand-drawn border separating each one. Simple banners between each section keep a consistent look throughout the page while setting apart each content area. CreativeSwitch uses images similar to distinct headers for each section of the site, clearly marking transitions between different types of content. Even something as simple as a thick black bar can be enough to set your content areas apart from each other, as is done here. The Tomatic website uses a retro rocket and space exploration theme. The header includes a rocket with planets. Various other sections on the site continue the retro theme, and then the footer includes a robot and UFO on a planet’s surface. Each section is set off with a unified header. Big backgrounds are popular in all kinds of website design, but single page designs open up new possibilities for large backgrounds. Many designers take advantage of large background images as a way to set apart their content areas while maintaining a unified look to the entire site. For example, some sites might have a scene in the background that starts with a sky at the top with one content area, then further down they have a ground-level scene with another content area, and at the bottom they have an underwater scene with yet another content area. The possibilities with this kind of site are almost endless. This coming soon page is another great example of using a unified theme throughout the site. The Volll site uses a seascape/landscape image for the background, with the main content at sea level. Additional information shows up above the main content in the sky and below in the water, right down to the ocean floor. Jamie Wright’s site uses a more abstract, colorful theme throughout. It really sets the site apart and draws your attention exactly where it should be. Luke Larsen’s site uses a background that resembles a goldfish bowl. This is one of the most innovative background designs I’ve seen. As you scroll down the page, colored bars in the background interact with other background elements to produce a one-of-a-kind effect that’s hard to even explain (so go check it out!). If you have a bit more content to display but still want to stick to a single page design, consider using JS and Ajax to hide some content while others is displayed. Slideshows are the most popular techniques for incorporating JS, but modal windows and other methods are also used. Jon Brousseau’s site uses JS for subtle enhancements like modal windows and tooltips. Below are a bunch of other great single-page website designs. One-page websites can be a fun and different way to design a site, whether it’s your own personal site or for a client. Consider ways to differentiate your one-page site that might not work as well on a multi-page site. Things like big background images or certain Ajax techniques work really well on one-page sites and have a bigger impact than they do on more complex sites. Minimal content. There’s only room for so much content on a single page. Consider horizontal scrolling. While not all horizontal-scrolling websites are single pages, it’s a format that lends itself well to the one-page format. Consider screen size. Creating content areas that fit within a visitor’s screen without requiring scrolling is common in single-page sites. Clearly set apart each section. You don’t have the convention of separate pages for different content, so you need to figure out another way to delineate content areas. Take advantage of bigger backgrounds. Single page sites are often longer or larger than other pages, giving more opportunities for creative use of big backgrounds. A gallery of single-page website designs. A showcase from Tutorial Blog. A showcase of single page sites from Dzine Blog. The single page design category from DesignBombs. An excellent showcase of designs from Web Designer Wall. A large showcase from InstantShift. A tutorial from Spoon Graphics that shows you how to create a one-page portfolio site. A rundown of the pros and cons of single page sites from a business perspective. I love these sites, they make the web feel so modern. I love that site! great find! Thanks for that great article! I’m going to design a one page site soon and that was exactly what I was looking for. Great examples also! Truly fantastic designs! Nice round-up! Very nice list. I thought that a single page website only suitable for selling purpose and design portfolio. Any other idea about this? great post and designs. love these single-page sites. That is a good list of one page websites and sets a high benchmark. Great tips and example about this type of website. I like to make as style in Portfolio website. These are great examples. We made the decision to go single-page as well at http://www.websitemuscle.com/, and I think it was the right decision. Great collection! Always love these roundups. 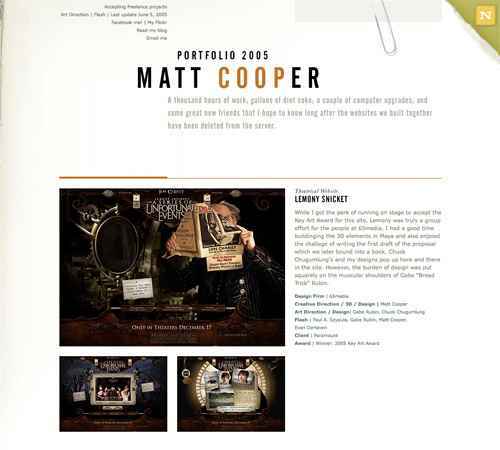 Also check out http://www.nickhand.net – One-page portfolio example! Good article! We do see more and more of these single-page websites. I actually created one for my wedding last year. Very impressive list of themes.Thanks for sharing.Looking forward some new things. I like this site http://www.robertomarzola.it what do you think? yeah, love single page sites. Bookmarked! Great post! I love one page websites! I really like the in review points. Thanks! I have a one-page site. Take a look and let me know what you think. Great resource. Thanks! My latest portfolio is single page. Had lots of fun building it and I can’t see myself switching back to multi-page now. Just this, Cameron: on a commercial site in which contact is offered, I was told on webmasterworld, the Feds “require” a privacy notice (under penalty of fine). Think this deserves a separate page? These are all great example on how a simple single page site can be very interactive and dynamic. great examples, thank you for the post. I came across one such site of my ex-company and was inspired to think of designing on those lines. I feel that the site http://www.plusthought.org outshines the sites shown in examples via extensive use of AJAX/JS to display multiple-content-items in one interface without re-loading. I’ve used coda slider to make my one single page website. check it ! Nice wrap-up about Single-Page Websites, thank you. Huge but poor selection of websites. Quantity over quality I would say. Thanks for great post and inspiration! I recently came across http://www.leukocyt.com . To be honest it is a rather cpu intensive site, but I really liked the desing. Yes, single page websites have certainly come a long way from the 80’s! Remember when they used to be flat, white with a logo and a phone number…some of these still exist unfortunately! I’m EXTREMELY tired of these formulaic, topheavy template sites with giant headers. WordPress and Tumblr are making designers lazy. It was made with no use of jQuery. Nice Post :) Love it! some great examples here. my new site is very near to launching and funnily enough it’s based on a single page structure so this is very timely to see. Thanks! I used these as a guide to design my one page portfolio! I find the best single-page folio site to be Cuban Council http://www.cubancouncil.com really nice, clean and functional. Once again, these are nearly all web/graphic/designer/portfolio sites. How about some real-world sites done for actual clients who sell real products and services? Everything seems to be about web designers designing to impress other web desigers. Were are the clients’ sites? Like all of these ‘best website’ showcases, it’s just another huge desiger circle-jerk. thx for great mood during walking at the collection! great designs, high inspiration! how do you design the example after the CONSIDER HORIZONTAL SCROLLING subtitle…..??? anyone? good sort of examples ,really i had been looking for some guidance,thanx for the post,.,.. Thanks for a wonderful article! I have a client who simply needs a one pager and it’s hard for me to break out of my box. This is a good looking collection of single Page web design. I like it. I want to do something like that but I don’t know how. Is there any tutorials or finished sites that can be downloaded and just change pictures? Very nice compilation. Thanks for sharing. Hello! Thank you for the tips. I have a question: How good are “onepagers” with SEO and the new Google algorithm? Guillermo, as per my experience One Page sites are tough to have SEO done. A good website consit of quality contents that are branched out on various pages. Single page sites were best used for landing pages when there was only HTML. Now the trend is changing and you see many single page site with quality effects on it. As per new Google algorithms, i am not sure about it yet. But i am working on a single page site and doing seo on it, lets see how it goes. i will surely share it here.